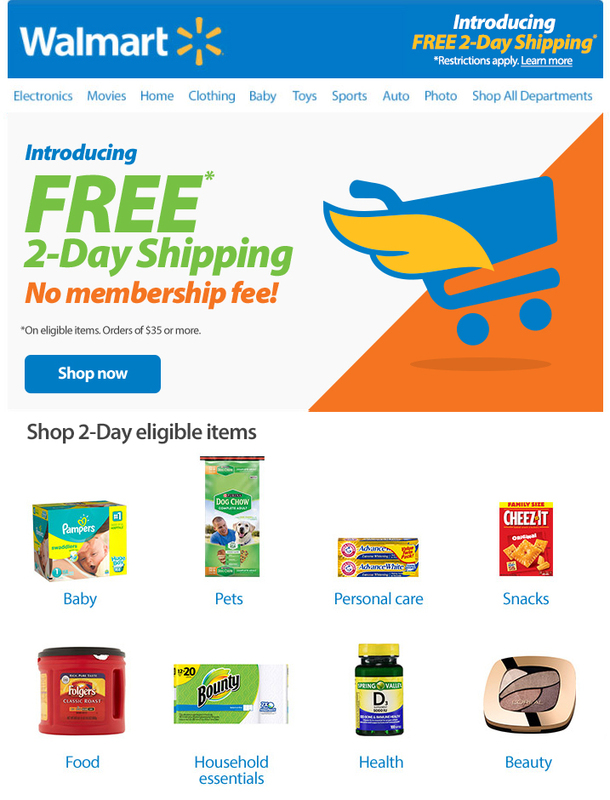 Walmart’s free two-day shipping will be available on the items customers shop the most, including household essentials such as baby necessities, pet products, food, like cereal and peanut butter, cleaning supplies and beauty favorites, as well as top electronics and toys. In addition to offering two-day shipping to stores, Walmart continues to offer same-day store Pickup on many items. Pickup is currently available at more than 4,600 stores. The company also continues to offer Online Grocery Pickup at more than 600 locations across the country, with plans to expand the service in the coming year. “In today's world of e-commerce, two-day free shipping is table stakes. It no longer makes sense to charge for it,” added Lore. *Freight and marketplace are not included. Program is available in the contiguous United States. Wal-Mart Stores, Inc. (NYSE: WMT) helps people around the world save money and live better - anytime and anywhere - in retail stores, online, and through their mobile devices. Each week, nearly 260 million customers and members visit our 11,593 stores under 63 banners in 28 countries and e-commerce websites in 11 countries. With fiscal year 2016 revenue of $482.1 billion, Walmart employs approximately 2.4 million associates worldwide. Walmart continues to be a leader in sustainability, corporate philanthropy and employment opportunity. Additional information about Walmart can be found by visiting http://corporate.walmart.com on Facebook at http://facebook.com/walmart and on Twitter at http://twitter.com/walmart.